South Carolina needs to make changes to improve its fiscal fitness. Adopting the Budget Stabilization Fund advanced by Senator McConnell in the past few years would be an important start, holding excess revenues in good times and protecting against damaging cuts in bad. So, too would taking a longer view than our one-year budgeting horizon. Pay-as-you-go budgeting, supported by multi-year revenue and cost projections and current services budgeting, is far preferable to rigid, formula-based limits that do little to address the actual long term needs of our state and undermine the ability of the General Assembly to determine and fund our state’s needs. Many have claimed a need to limit the ability of the General Assembly to appropriate funds in coming years by imposing a spending limit of some sort. South Carolina, of course, currently has a spending cap based on “the average growth rate of the economy of the State,” measured by the growth in personal income. In other words, we already cap spending based on the growth in the ability of our citizens to pay those taxes. State spending (General Fund, highway funds and EIA) has been shrinking relative to personal income – the best measure of our ability to pay for public goods. 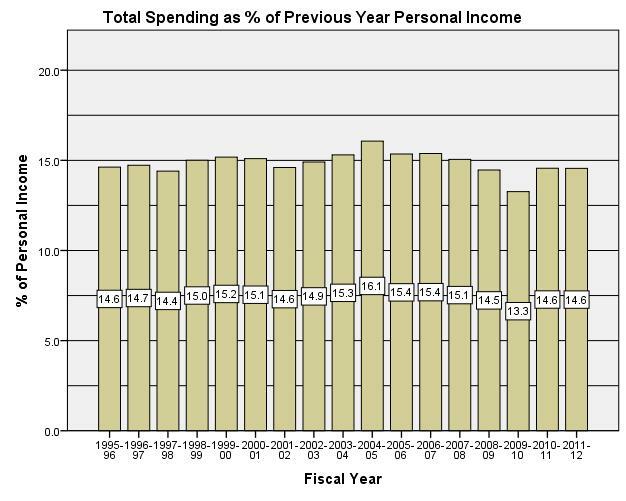 In FY95-96, we spent 7.5 percent of personal income. In FY11-12, we are spending 4.8 percent. a percentage of previous years Personal Income in South Carolina. 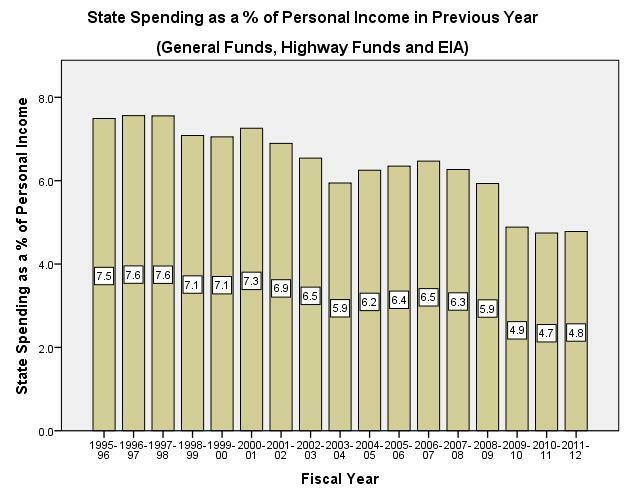 Although there was a slight bulge in the middle of the past decade, FY2011-12 appropriations are the same proportion of state personal income as it was in FY1995-96—14.6 %. Leaving aside the constitutional and statutory spending limitation currently in effect, South Carolina has a stricter spending limit that has effectively limited state spending: the General Assembly can’t spend more than it has. A stricter spending limit may be attractive to some. You should exercise extreme caution. Colorado in 1992 adopted as strict revenue limit known as TABOR, the Tax Payers Bill of Rights. That revenue limit so hobbled the state that Coloradovoters suspended key parts of it for five years in November of 2005. Colorado business and political leaders of both parties have concluded that a strict cap like TABOR is bad for the state’s economy. Neil Westergaard, Editor of the Denver Business Journal, has declared that “[Business leaders] have figured out that no business would survive if it were run like the TABOR faithful say Colorado should be run — with withering tax support for college and universities, underfunded public schools and a future of crumbling roads and bridges.” —We urge the members to review the video, The Real Story behind TABOR, at http://www.cbpp.org/cms/index.cfm?fa=view&id=2482 on the experience ofColorado with a strict revenue limit known as TABOR. If we were to revise our spending cap, the General Assembly needs to be very careful of its design. Some have suggested indexing spending by the growth in population plus the growth in the Consumer Price Index (CPI). CPI is a measure of change in consumer spending based upon pricing a market basket of goods and services purchased by households. However, government buys a very different set of goods and services than do households. (See Table 1 on next page.) For example, households don’t run prisons. Unfortunately, the cost of things that government buys – K-12 education, health care, higher education and transportation – grows faster than the cost of things which households buy for a number of reasons entirely unrelated to management effectiveness. The net effect is that a spending cap indexed to the CPI effectively shrinks government in terms of the services delivered to citizens. See David H. Bradley, Nicholas Johnson, and Iris J. Lav, The Flawed “Population Plus Inflation” Formula: Why Tabor’s Growth Formula Doesn’t Work, Center on Budget & Policy Priorities (January 13, 2005) at http://www.cbpp.org/cms/?fa=view&id=861. If you do include an inflation factor, the appropriate inflation factor for the things which government does buy is the deflator for state and local governments. That figure is readily available through the U.S. Department of Commerce, Bureau of Economic Analysis, as a part of the National Income and Product Accounts (NIPA) series used to estimate U.S. Gross Domestic Product. A significant structural flaw to most spending limit proposals is the Ratchet Effect. If you tie the spending limit to the previous year’s appropriation, you ratchet down spending when the budget is cut. When revenues recover coming out of a downturn, the new, lower spending limit makes those recovering revenues unavailable to put troopers on the highways, corrections officers back in the prisons and teachers in the classrooms. If you fall in a well, you cannot get out by just moving forward. You have to climb first. Any spending limit should be designed so that it does not re-base the limit when spending declines. You should only craft a flexible spending limit so that major events or needs can be addressed. For example, it is unclear to us that the General Assembly could have enacted Act 388 – which added over half a billion in revenues and costs to the state budget – if an inflexible spending limit had been in place. The General Assembly could not have adopted the EIA. In the future,South Carolinawill need to address a crumbling infrastructure. We may need to deal with natural disasters, court rulings or federal mandates. Without flexibility, the General Assembly’s only recourse will be to gut high priority services that you will want to fund and which common sense will say you should fund. South Carolina does need to make changes to how it does business in order to improve our fiscal fitness. A major problem with keeping our fiscal house in order is that we have a one-year planning horizon and make short-term decisions. As a result, members of the neither General Assembly nor the public are able to understand the long-term impact of tax and budget decisions. In recent years, the General Assembly cut taxes in good times and then had to cut services in bad times because it had only a one-year budget horizon. Likewise, if you begin new programs in good times, you have to cut either those programs or others when the inevitable downturn comes. If the General Assembly adopted a few budget management tools, South Carolina could better maintain budget discipline without forgoing flexibility. The cornerstone is a policy requiring that the General Assembly fully offset the cost of spending increases or revenue decreases over a five-year period through spending cuts or revenue increases. This is known as pay-as-you-go (PAYGO) budgeting. To do pay-as-you-go budgeting well, two additional tools are important. The first is multi-year budgeting … projecting both revenues and expenditures over several years as a central part of the budgeting process. Needless to say, those have to be realistic economic estimates. The other is “current services budgeting,” basing budgets on continuing current levels of services, given expected changes in the expected number of recipients, per-recipient cost and other factors. Today in most states, it is impossible for policymakers to know whether proposed program increases or tax cuts are affordable over the longer term. Nor do most states have appropriate mechanisms for considering and implementing tradeoffs among fiscal policy options. These problems impede decision-making and leave states vulnerable to serious long-term budget problems. These budgeting tools help states avoid enacting either spending hikes or tax cuts in flush times that are not affordable long-term. Unlike a rigid spending limit, a pay-as-you-go budget process maintains legislative prerogatives over the budget and allows for the possibility of program expansions or tax reductions when they are affordable. Over the years, Senators have indicated that the underlying structural budget concern was the effect of business cycles on the state budget leading to boom and bust budgeting. The solution to that is saving during good times to have funds available in bad times. Unfortunately,South Carolina’s Rainy Day Fund – the General Reserve Fund – is more like a Flood Fund. We can only use the General Reserve Fund when we are already underwater to cover operating deficits. At its Constitutional limit of, eventually, 5 percent of the General Fund, it is far too small to meaningfully carrySouth Carolinathrough as much as one year. Our experience over the past few years indicates that a 20 percent reserve is more appropriate. The other flaw withSouth Carolina’s General Reserve Fund is that it has to be paid back too soon—beginning in the year after it is tapped. Down cycles tend to last two to three years. That means that you are forced to refill the Rainy Day Fund while you may still underwater. It’s like putting money in savings when rain is still falling, your basement’s flooded and you really need to repair the leaky roof. We would urge that you change the Constitution to require a larger and more flexible Rainy Day Fund designed as a savings account to get the state through economic downturns with less budgetary disruption and regularized funding of services for our citizens. Additionally, we would urge you to change the repayment requirements so that the state has moved out of the down cycle before the General Assembly is forced to repay the Rainy Day Fund. Senator McConnell has over the past few years introduced a Budget Stabilization Fund, which, with a couple of tweaks, is an excellent approach to a Rainy Day Fund. Combining pay-as-you-go budgeting, supported by multi-year revenue and cost projections and current services budgeting, with a large Rainy Day Fund to hold excess revenues in good times and protect against damaging cuts in bad would go a long way to improving the fiscal fitness of our state. These approaches are far preferable to rigid, formula-based limits that do little to address the actual long term needs of our state and undermine the ability of the General Assembly to determine and fund our state’s needs. Presented to SC Senate Judiciary Subcommittee on Fiscal Fitness, November 16, 2011, on behalf of SC Appleseed Legal Justice Center and AARP-SC. This discussion follows Iris J. Lav, PAYGO: Improving State Budget Discipline While Retaining Flexibility (Center on Budget and Policy Priorities, September 22, 2011) at http://www.cbpp.org/files/9-22-11sfp.pdf. This entry was posted in SC Budget and tagged budget discipline, rainy day fund. Bookmark the permalink.